So, I recently returned from a tour of Ireland. I have traveled a decent amount, been to many amazing places—Italy, New Zealand, Switzerland, France, Germany, Mexico. And I have seen many amazing things. But Ireland is my favorite. Not just because it’s fresh, although I can see where a harried traveler might lose sight of anything beyond the most recent of amazings. 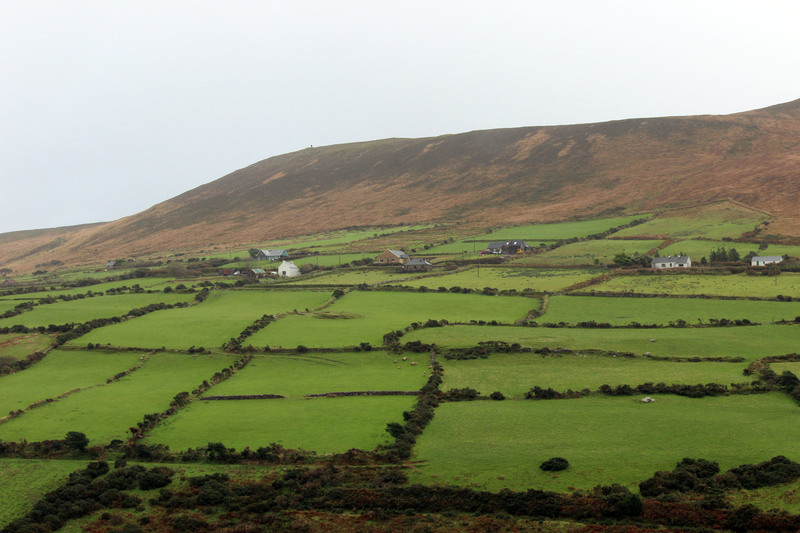 Ireland is my favorite because it offered a sampling of all of those other trips plus so much more. Mountains? Cliffs? Beaches? Meadows? Ocean? Rivers? Lakes? Forests? Check. Diet Coke? Close enough to count. My plan is to touch upon the highlights (for me) and follow up with subsequent blogs with more specifics. We did and saw so much, I couldn’t possible justify bending your eye for the time it would take to go through everything in detail! 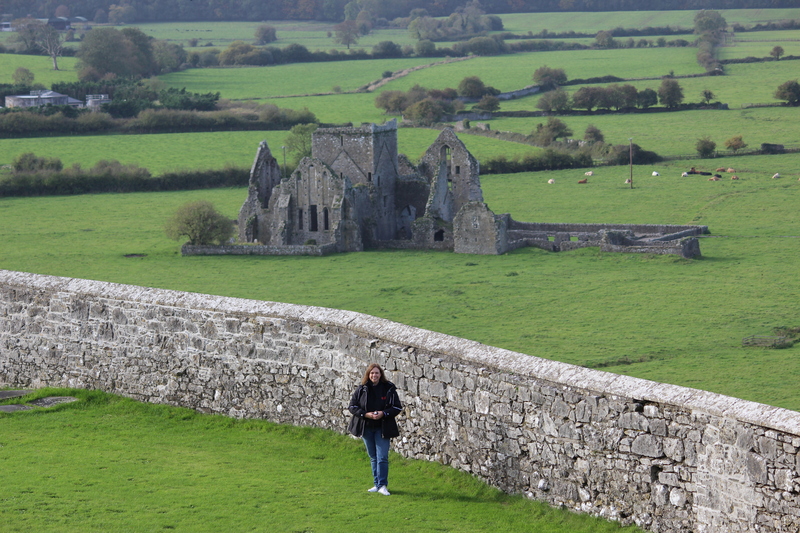 As I recall my adventures in Ireland, I keep thinking, oh that was my favorite! And it’s true. They were all my favorite. 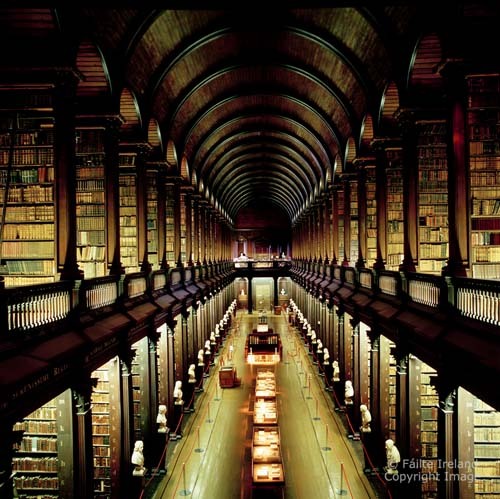 I loved visiting Dublin’s Trinity College- the Book of Kells, and the Long Room. I love old books! Illuminated manuscripts, even better! I love old libraries! The Book of Kells is an illuminated manuscript containing the four Gospels of the New Testament among other writings, circa 800. It’s gorgeous. And there’s an app for that! The Long Room is indescribable. It’s that cool. I didn’t know seeing it was on my Bucket List until I saw it, and now I dare not cross it off for fear of not returning. 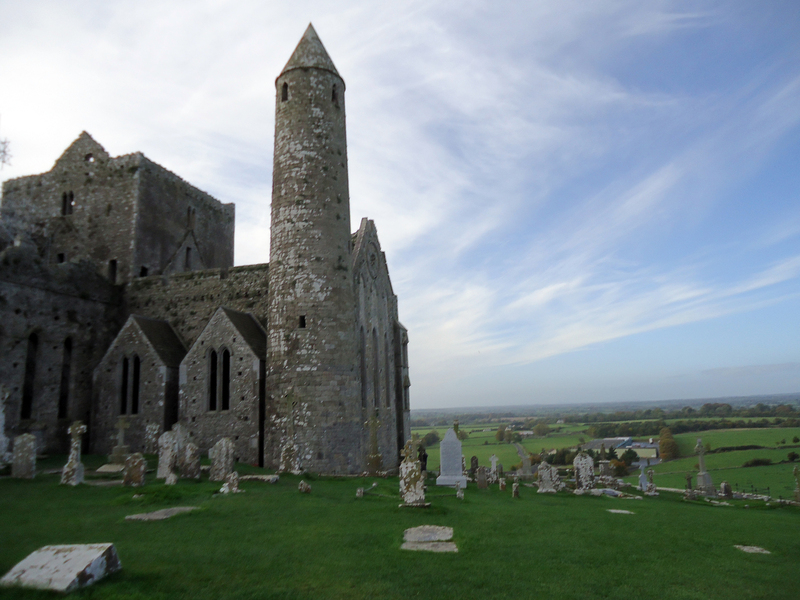 Our first bus excursion was to the Rock of Cashel. Breathtaking castle ruins bursting with history and photo ops. 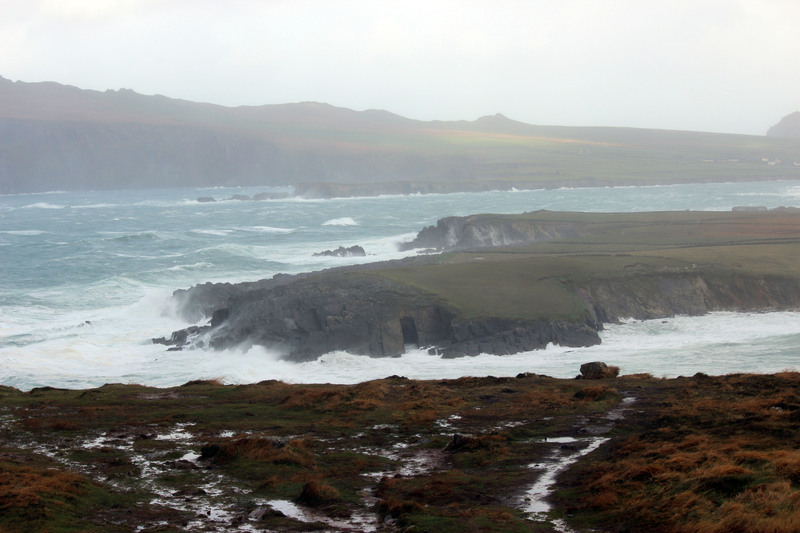 Our day along the Dingle Peninsula was, how shall I say, a bit breezy… Hurricane-like gusts mixed with the devil’s unguarded sneezes? Yes, that sounds about right. The coastal views were gorgeous, worth every splattering of devil’s phlegm. Ní hé lá na gaoithe lá na scolb. It was a bit challenging to take pictures or maintain any semblance of a hairstyle, but it was a humorously good time. Fighting that wind to snap a few shots was a full body work out! It was the weather I expected, luckily this was the only day with those extremes. The meals the tour provided were exceptional, as were the meals we got on our own. I expected Irish food to be bland and starchy, but it was full of flavor! The appetizers, salads, soups, vegetables, meats, and desserts were wonderful. And the potatoes! Oh my, the potatoes tasted the best! Sounds silly, I know, but I miss the potatoes. Other favorites were the Irish Shepherd’s Pie (which I sampled off Linda’s plate! ), the seafood chowder was to die for, so chunky and tender and loaded with creamy goodness, the calamari and chips (the fish and chips were good, but the calamari, also sneaked from Linda’s plate, was absolutely melt in your mouth! 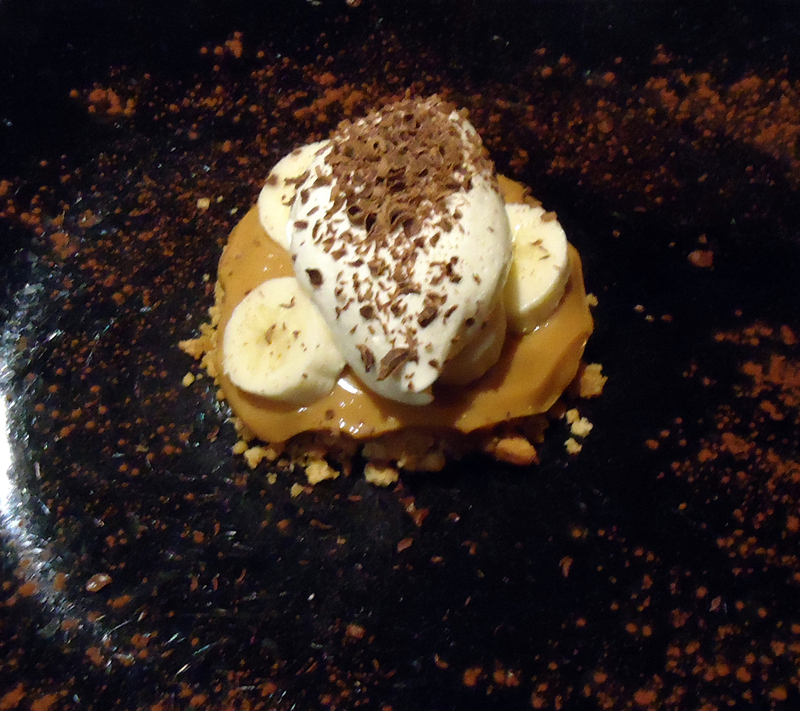 ), an appetizer made with avocado and shrimp with a Bloody Mary sauce proved unique and tasty, and of course, the Banoffee Pie (thanks for the recommendation Donie)! Of course we had Guinness. And Jameson’s. 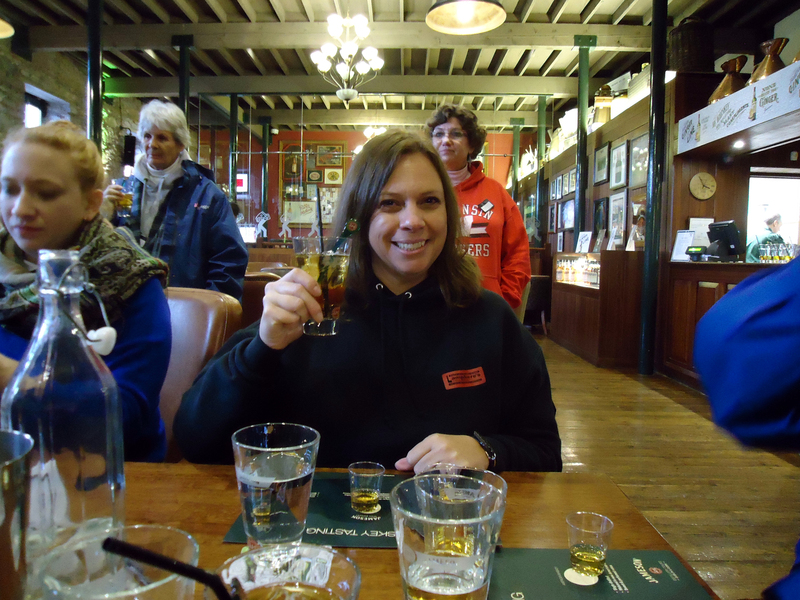 I participated in a taste test at the Jameson Distillery distinguishing the differences between single, double and triple distilled whiskeys. But my Irish beverage of choice was Bulmer’s Cider. Much lighter than the stout drafts. Much kinder than the whiskeys. 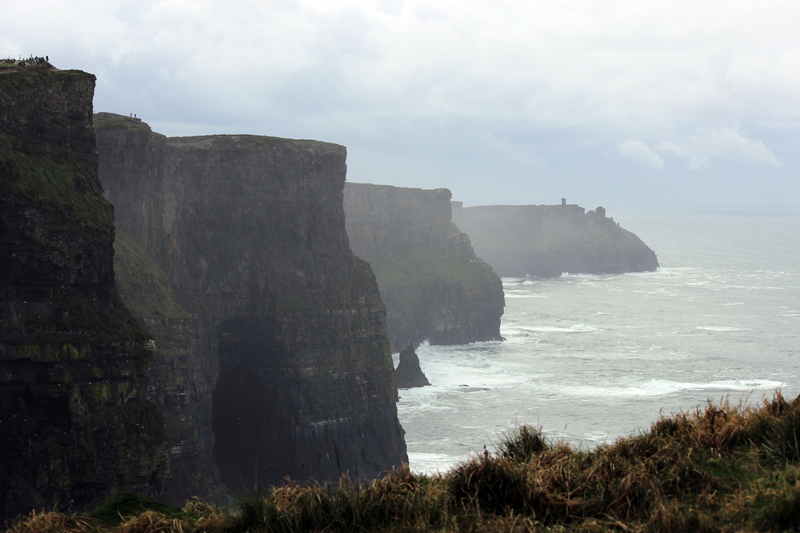 The Cliffs of Moher are as gorgeous in person as they are in the photos you’ve seen. But in person you get to appreciate their greatness. Once you pass out of Moher Park, you can literally walk along the edge! Let me clarify, the edge is literally right there and YOU can walk along it. Not me. 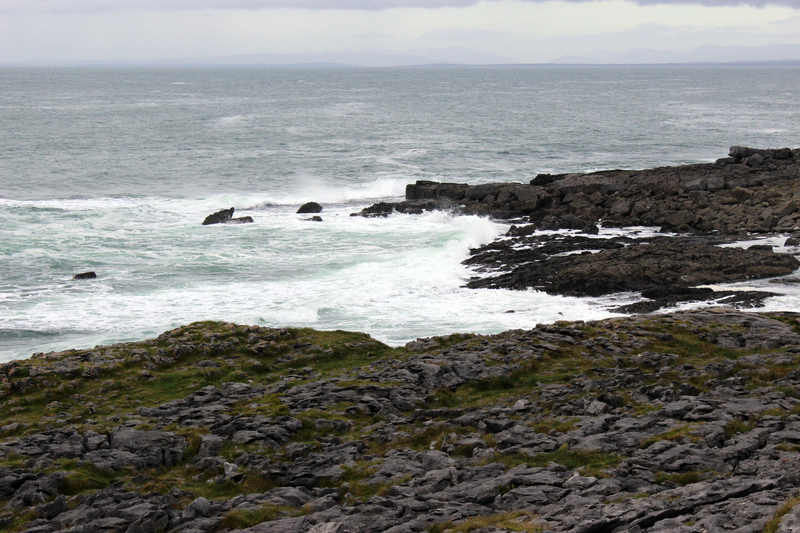 The Burren is a karst-landscape. You can read the description, or you can believe me when I say it’s like being on the surface of a distant planet, totally foreign, rocky and craggy. 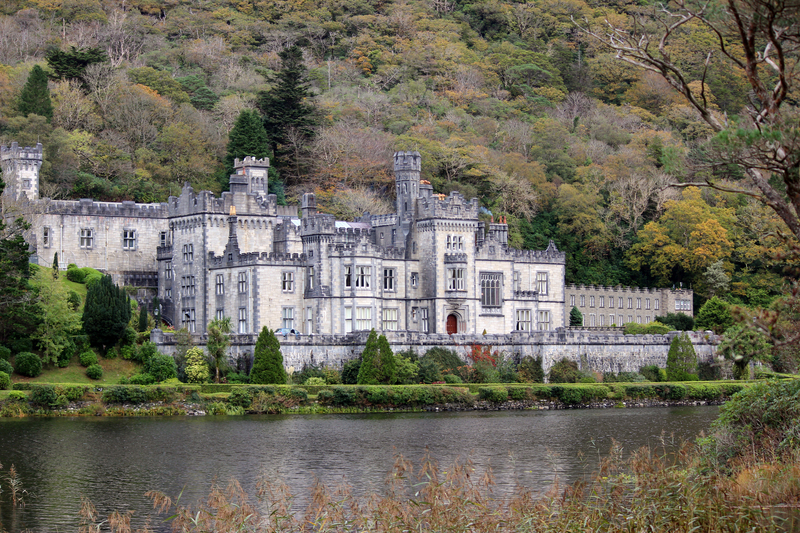 Kylemore Abbey is a castle at the base of a mountain on a lake surrounded by woods. Fairy-tale perfection. Gorgeous. The people of Ireland are friendly and helpful. Of course the ones that work in the tourist trade have to be, but most of the others that we came across were equally charming. Except for the handful on the train, but that’s a story for another (Mon)day. A terrific example of friendly Irish are the Brennans of Kroc House who invited us to their home for a Yeats Experience that included a gourmet meal, histories and readings. I’m sure you are familiar with the Great Irish Famine, but did you know in Ireland it’s referenced as the Irish “famine”? Every time I saw it in print, it had quotation marks around it. Because it wasn’t a true famine. Yes, there was a potato blight that ruined much of the country’s crops, but there was plenty of other food available. It was withheld from the masses, exported even, in an example of cruel and intentional governmental control. Millions starved to death or emigrated. Insane. We wrapped up our tour with a visit to the Brazen Head, Ireland’s oldest pub. We were graced with storytelling, music and a delicious meal. The entertainment was wonderful! A delightful way to end an amazing week. It may seem like I’m missing things, but these highlights are just that, quick points of reference from a trip of a lifetime. As promised, I will elaborate in future blogs. Too many stories to not share! Too many gorgeous photos to keep to myself. Not to mention the Weird List. níl aon tintéan mar do thintéan féin. This entry was posted in My Travels and tagged Book of Kells, Brazen Head Pub, Bulmer's Cider, Cliffs of Moher, Dingle Peninsula, Dublin, Guinness, Ireland, Jameson Whiskey, Kylemore Abbey, Mary Lamphere, Rock of Cashel, The Burren, The Long Room, Trinity College, Yeats Experience. Bookmark the permalink. Great blog, Mary. I will be following you. How about another thing to love about the Irish is that they give you a giant spoon for dessert! Loved reading this one!! I want to go there!! I will move into the long hall with nooks. Looks incredible! I’m glad you had such a great time. You brought back a lot of fun memories from our trip. Another point to the kindness of the Irish – Jamie accidentally cut off another driver cutting across traffic to return to our b & b. The driver turned around and came to check on us. He said he figured we were americans who got confused as he had done the same on a trip here. I’m sure the person he cut of called him all sorts of name and never thought to check on him. This story could have gone a whole different direction had it taken place in the Bronx!